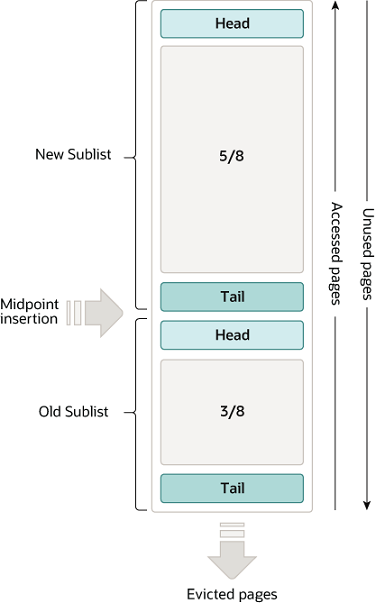 By default, pages read by queries immediately move into the new sublist, meaning they stay in the buffer pool longer. A table scan (such as performed for a mysqldump operation, or a SELECT statement with no WHERE clause) can bring a large amount of data into the buffer pool and evict an equivalent amount of older data, even if the new data is never used again. Similarly, pages that are loaded by the read-ahead background thread and then accessed only once move to the head of the new list. These situations can push frequently used pages to the old sublist where they become subject to eviction. For information about optimizing this behavior, see Section 14.8.3.2, “Making the Buffer Pool Scan Resistant”, and Section 14.8.3.3, “Configuring InnoDB Buffer Pool Prefetching (Read-Ahead)”. On 64-bit systems with sufficient memory, you can split the buffer pool into multiple parts to minimize contention for memory structures among concurrent operations. For details, see Section 14.8.3.1, “Configuring Multiple Buffer Pool Instances”. You can keep frequently accessed data in memory regardless of sudden spikes of activity from operations that would bring large amounts of infrequently accessed data into the buffer pool. For details, see Section 14.8.3.2, “Making the Buffer Pool Scan Resistant”. You can control when and how to perform read-ahead requests to prefetch pages into the buffer pool asynchronously in anticipation that the pages will be needed soon. For details, see Section 14.8.3.3, “Configuring InnoDB Buffer Pool Prefetching (Read-Ahead)”. You can control when background flushing occurs and whether or not the rate of flushing is dynamically adjusted based on workload. For details, see Section 14.8.3.4, “Configuring InnoDB Buffer Pool Flushing”. You can fine-tune aspects of buffer pool flushing behavior to improve performance. For details, see Section 14.8.3.5, “Fine-tuning InnoDB Buffer Pool Flushing”. You can configure how InnoDB preserves the current buffer pool state to avoid a lengthy warmup period after a server restart. For details, see Section 14.8.3.6, “Saving and Restoring the Buffer Pool State”.